Bernie Holtzman is a gracious sportsman who spent a lot of time playing volleyball, but he also spent a lot of time talking about volleyball (he still does! ), Holtzman once said that "Volleyball is God's gift to the beach bum." Bernie always had a lot of good things to say about his long time friend and partner, Manny Saenz, who he felt was the most natural volleyball player that he had ever seen. 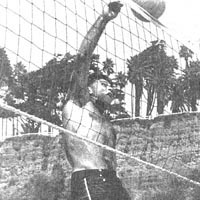 Holtzman first started to play volleyball on the beach in 1935. Holtzman was just 13 years old at the time, when he would hitchhike from Hollywood to the Santa Monica Pier area, where he would hang out at the "Playground" Promenade and Arcadia Terrace. This is where he first tried to get into the volleyball games that were taking place. Eventually one of the older players asked him to play in a six-man game, although he was only allowed to set. This was the beginning of Holtzman's illustrious career that was enhanced by the talent he acquired with the use of his exceptional hands. A few years later, while still in his teens and after numerous hours of playing, learning and training, Holtzman was the best player at the Playground. Holtzman and a fine player named Carl Stewart were winning all of the 2-Man games there. Holtzman was most successful on the beach with two different partners. His first tournament championship came when he paired-up with Manny Saenz at the 1948 State Beach Men�s Open. They formed an unbeatable combination. Together, they would hold the main court at State Beach, day-in and day-out. On the tournament circuit, they virtually won every event that they entered, during a period when there were only two or three "Open" tournaments a year. As a team, they ended-up with 10 "Open" titles together. Holtzman finally teamed-up with Gene Selznick, forming another "almost" unbeatable combination. Selznick and Holtzman were virtually unbeatable during pick-up games and they only lost two tournament finals together. During a period when there were only a few "Open" tournaments a year, from 1955 through 1957, Holtzman won 18 out of 20 "Open" tournaments with Selznick, including the 1957 "Volleyball Extravaganza" that featured Greta Tyson�s famous kiss. Bernie also had enormous enthusiasm for the indoor game and was a distinguished player in the gym. He was a star player for the famous Hollywood YMCA Team. In the year 2000, when Holtzman was 77 years old, he was still playing volleyball at the Hollywood YMCA, two to three nights a week. In 2004, at age 82, when the Hollywood YMCA scheduled "Volleyball-Play" in the Gym for 10:00pm, Holtzman stopped playing volleyball, but began to learn the sport of Racket-Ball, since the courts were available at all hours.